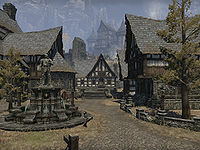 Shornhelm, sometimes spelled Sharnhelm, is a city in northern High Rock which stands at the center of one of the eight kingdoms of the region. It is known for being the Keeper of the Crypt of Hearts. The city was controlled by House Dorell of the Breton nobility in the 24th century of the First Era. In 2E 541, after helping to defeat a horde Reachmen led by Durcorach the Black Drake, Shornhelm, along with Daggerfall, Camlorn, Evermore and Wayrest, signed the first Daggerfall Covenant. In 3E 277, the kingdom was offered to Andorak Lariat in order to persuade him to drop his claim to the Imperial throne. The Lariat family reigned in the kingdom from that point on. Esta página foi modificada pela última vez à(s) 20h43min de 26 de novembro de 2015.